PTFE Spring Energized Seal Provides Low-Friction Performance in Food Product Dispenser - Eclipse Engineering, Inc.
With these additional considerations, food industry seals often have to operate under the same strenuous conditions and performance specifics as many industrial or aerospace applications. Things like pressure, temperature, and systems dynamics can create challenges for many standard seals. Many food production processes involve cooking or pasteurizing, calling for high temperature performance requirements. And production line operations can demand seals capable of handling high-speed dynamics and extreme duty cycles. Like many projects at Eclipse Engineering, a customer came to us after an off-the-shelf rubber seal was failing in their food product pump. With no simple solution in sight, they turned to Eclipse’s expertise to engineer a product that would meet their performance requirements while still complying to all food safety regulations and procedures. The customer had developed a new device designed to dispense a condiment food product in a restaurant situation. The automated dispenser had to keep the product at a warm temperature and dispense a specific amount when used. The customer had originally chosen a typical FDA Elastomer U-Cup for the main piston seal. This inexpensive and off-the-shelf solution sealed well, and performed satisfactory in their initial lab testing. But once employed in the field, some issues came to light. During long periods of inactivity, the food product was somewhat solidifying in and around the seal. The sustained temperature was almost cooking the product into groove of the seal. Once this happened, the seal essentially lost all compliance in the material and geometry. Without any give, the friction between the bore and piston became great enough that the mechanics of the dispenser could no longer move the piston effectively. Thus, correct dispensing was not occurring. During periods of sustained use, such as in their preliminary testing, the product had no time to solidify, so the issue was not initially detected. The unpredictable nature of the restaurant industry could mean days of heavy use, or days with almost no actuation at all. In either case, the seal needed to perform consistently. In addition to the main problem of frictional force being too great, concerns about cleaning procedures with the original seal also presented themselves. The solidified food product in the seal could become difficult to remove during the scheduled cleaning processes, creating a problem for the personnel and introducing a potential insufficient sanitary condition. Eclipse knew this would be a perfect application for a PTFE Spring Energized Seal, but one would need to be tailored to this specific application. Starting with the requirement that all seal materials would need to be FDA compliant, Eclipse chose it’s ET018: Mineral filled PTFE for the seal jacket. FDA compliance limits the potential use of many common PTFE fillers such as carbon and molybdenum disulfide. While Virgin PTFE and other unfilled materials are compliant, their wear resistance is not ideal in most dynamic situations. The Mineral filler greatly improves the mechanical properties and resilience of the PTFE, while still meeting the FDA requirement. The coefficient of friction of a PTFE-based material can be roughly 1/10th that of a typical rubber elastomer seal. So overall loading characteristics and motion of the piston will be far more consistent and fluid compared to the performance of the original seal, both in short term and long term use. Turning to the spring, Eclipse chose its stainless steel Cantilever V-Spring. The characteristic of the V-Spring lends itself to high point loading, which is ideal in reciprocating applications where viscous media needs to be scraped. In conjunction with a scraper seal lip geometry, this provides optimum focus of the sealing force at the most critical point in the seal. The V-Spring also facilitates the use of a critical feature applied in many FDA and food seals, a silicone-filled spring cavity. Filling the spring cavity with silicone completely encapsulates the spring and essentially eliminates any grooves for product to become trapped. Eclipse uses FDA compliant and NSF listed Silicone that’s available in various colors such as Clear, White, and Red. Without the silicone fill, a V-Spring and groove would be highly susceptible to media becoming trapped in the groove, and potentially even behind the spring itself. The silicone fill means there are no cavities for entrapment, and the seal has a continuous, smooth surface on all sides — making it a perfect for standard clean-in-place practices. The relatively soft silicone still allows the spring to operate and provide force in its designed direction. But care must be taken, as it will contribute to the load characteristics of the seal. With friction being a concern in this application, Eclipse made sure that the silicone did not contribute any extra spring force by adjusting the PTFE jacket geometry and installed interference. The customer was excited to test Eclipse’s new design in their application. Upon initial testing, they were impressed by the lower friction of the new PTFE material, which improved consistency of the piston movement. The true test came after long-term inactivity, as there was a chance for the food product to solidify. The customer was pleased to find that the force required to move the piston remained almost constant, regardless of the amount of static time. 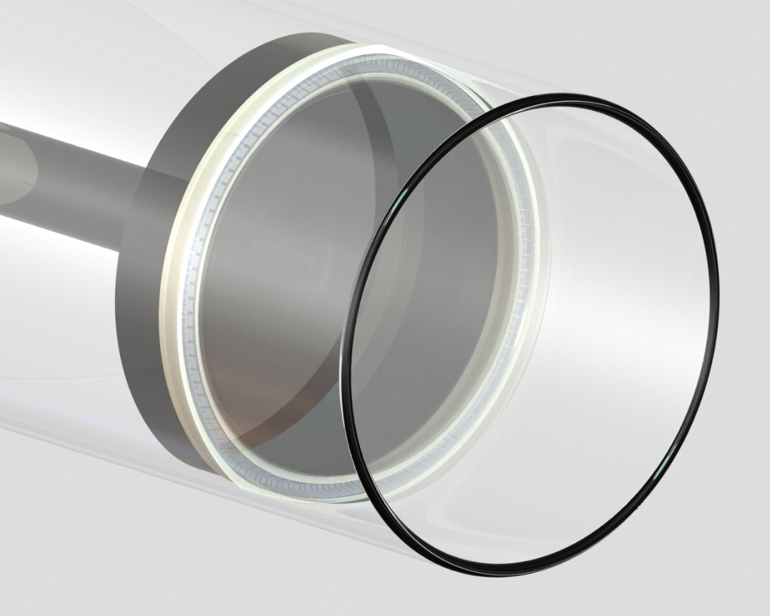 The silicone-filled spring cavity prevented any product getting entrapped within the seal. Combined with Eclipse’s custom seal geometry, this ensured the piston always moved in a controlled and reliable motion and dispensed the required amount of product in all situations. The added ease of cleaning was a bonus feature that was an additional selling point for the customer. 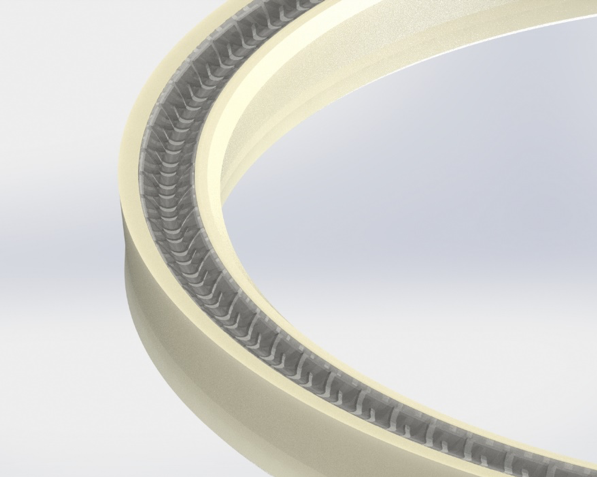 Contact us today to see if PTFE Spring Energized Seals are right for you.